Percy Jackson was supposed to be 12 years old when the series started. The actor looks nowhere like he was in sixth grade. He looks more like a highschool freshman or even older, and resembles Zac Efron of HighSchool Musical fame. He is cute though. :) As for Athena's daughter Annabeth, wasn't she supposed to be blonde like her mom? I like her, she's pretty and has personality, but she just didn't fit the description. And where was her cap of invisibility? I'm also not very happy about how they presented Camp Half-Blood Hill (Mr. D was missing too). It seemed so medieval. The boyfriend says it was very Spartan-like. The Camp was supposed to look like just any other camp, and the campers wearing shorts and t-shirts. No, in the movie they wore armors and they had old-school cabins. Chiron also knew beforehand who Percy's dad was, instead of having to wait for it to be revealed. So that meant that Percy didn't have to crash at the Hermes cabin at all. There were other points of departure from the novel, and I probably won't be able to name all of them now. Now I realize that all I've got to say are criticisms, aren't we normally like that? If I didn't read the book prior to seeing the movie, I might have appreciated it more. All in all, it wasn't a very memorable movie. I haven't seen the movie, but we've had the book for probably over a year. Alfred read a review of the book on the paper so we went ahead and found a copy. Kaya lang, I never got the chance to read it until now. It's really a book for children, it's pretty much straight to the point. There's no long description of the setting or the characters, so they're not giving you much time to get bored. On the downside, there's really not much room to let your imagination roam either. Oh they did take a few lines describing Hades' realm, and then briefly Olympus. It did kind of force me to think about mythology, a subject that I haven't thought much about since reading my brother's high school book of mythology when I was a lot younger. Here in the Philippines, Greek and Roman mythology is discussed in third or fourth year high school, but our English curriculum didn't seem to have adhered to that. We tackled only a few stories, if I remember correctly. So I've forgotten much about mythology, and Percy Jackson is a good review. 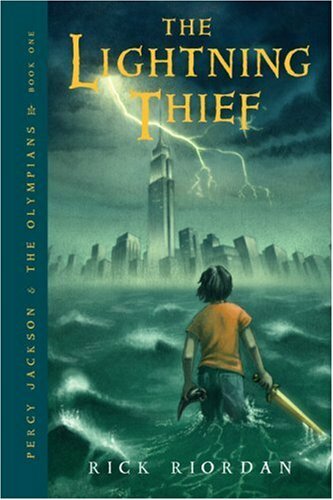 If you want your kids interested in mythology, Percy Jackson and the Olympians is a good way to start.